On Saturday morning, Brazilian federal prosecutors from the Car Wash Task Force threatened to resign if the Brazilian Senate and President Michel Temer approved a bill that would compromise the independence of judges and prosecutors. 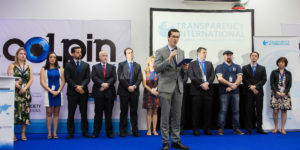 The announcement was made by Deltan Dallagnon, lead prosecutor of the Lava Jato operation, during a ceremony in which Transparency International awarded the group of prosecutors in charge of the case with the 2016 Anti-Corruption Award. “Regarding our possible resignation, it’s not a matter of giving up, but of recognizing that once the line is crossed, Car Wash authorities are helpless against legislators that use their power to protect themselves. This may be the beginning of the end of Car Wash,” Dallagnon said to a room full of journalists and anti-corruption advocates. The announcement comes after Brazil’s lower house voted to weaken the “10 Measures Against Corruption” legislation – a set of reforms pushed by the Car Wash Task Force to strengthen the ability of public administrators to prevent and detect corruption, and law enforcers to investigate, prosecute and sanction it. According to a statement released by Transparency International, the modified version of the law “removed essential features on whistleblower protection and illegal campaign financing and introduced an amendment that opens the door to prosecute judges and prosecutors for liability offence.” In extreme cases, normal functions of prosecutors could be interpreted as unlawful. Dallagnon also urged international actors to support their fight. Chair of Transparency International José Ugaz and federal prosecutors also condemned the manner in which Brazil’s lower house approved the legislation – the measure was discussed and approved during an overnight session on 30 November, the same day thousands of Brazilians were mourning the death of 71 members of the Brazilian soccer team Chapecoense, who were en route to Colombia when the plane in which they were traveling crashed. “Congress says that they represent the people; however when they approved the midnight deal, they did not represent the people’s interests, and betrayed a clear conflict of interest. The sovereign power still belongs to the people, and the public’s interest is the sole guide,” Dallagnon said. Dallagnon concluded his remarks by thanking Transparency International for taking a stance on the issue, and making a final call to the Brazilian people.